We have already seen that Geomorphic processes can create land forms. 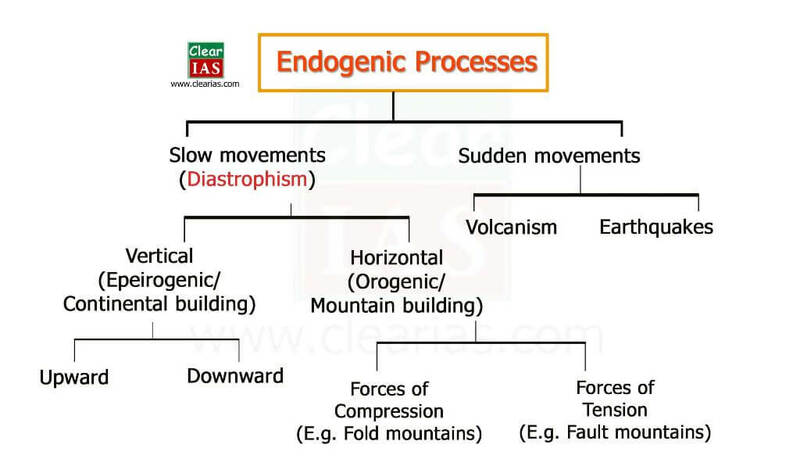 We also know that endogenic forces (internal) and exogenic forces (external) are the two main types of geomorphic processes which results in earth movements. In this post, let’s study endogenic forces in detail. Endogenic forces a can be classified as slow movements (diastrophic) and sudden movements. Slow movements cause changes very gradually which might not be visible during a human lifetime. orogenic processes involving mountain building through severe folding and affecting long and narrow belts of the earth’s crust. epeirogenic processes involving uplift or warping of large parts of the earth’s crust. earthquakes involving local relatively minor movements. plate tectonics involving horizontal movements of crustal plates. Slow movements can again be classified as vertical movements and horizontal movements. The broad central parts of continents are called cratons and are subject to epeirogeny. They do not bring any changes in the horizontal rock strata. While they cause upliftment of continent, they can also cause subsidence of continent. These movements are originated from the centre of the earth. Horizontal forces acts on the earth’s crust from side to side to cause these movements. They are also known as orogenic movements (mountain building). They bring a lot of disruptions to the horizontal layer of strata leading to a large structural deformation of earth’s crust. They can be classified as forces of compression and forces of tension. 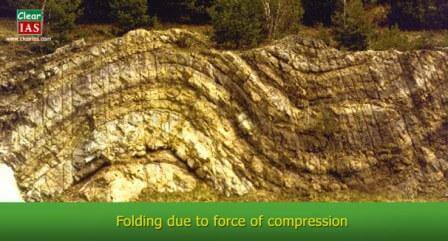 Forces of compression are the forces which push rock strata against a hard plane from one side or from both sides. 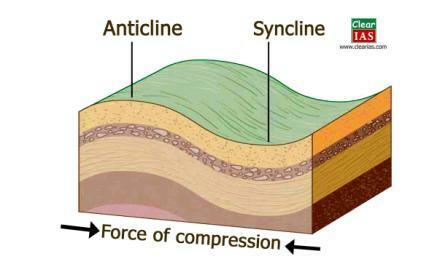 The compressional forces lead to the bending of rock layers and thus lead to the formation of Fold Mountains. Most of the great mountain chains of the world like the Himalayas, the Rockies (N. America), the Andes (S. America), the Alps (Europe) etc are formed in this manner. Forces of tension work horizontally, but in opposite directions. Under the operation of intense tensional forces, the rock stratum gets broken or fractured which results in the formation of cracks and fractures in the crust. The displacement of rock upward or downward from their original position along such a fracture is termed as faulting. The line along which displacement of the fractured rock strata take place is called as the fault line. 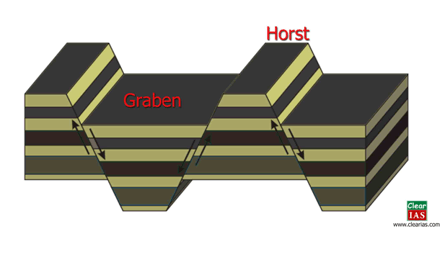 Rift valleys with steep parallel walls along the fault are called as Graben and the uplifted landmass with steep slopes on both sides are called as Horst. The very steep slope in a continuous line along a fault is termed as Escarpment. Examples: Volcanoes and earth quakes. Next article in the series: Volcanoes: Everything You Need To Know. Superb Sir,Please carry on this type of writings,its of ultra help to us. 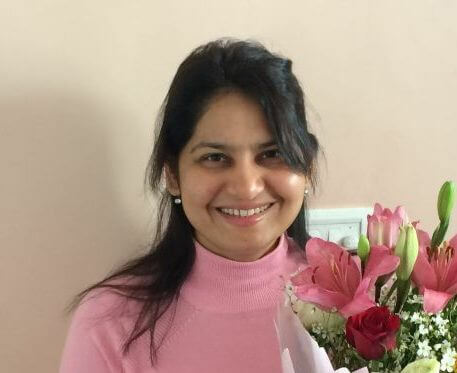 Good job for help of achivers. And very useful quick and short notes. This is fabulous.please carry on..